Sonja Angerer discusses the importance of finding the right ink technology when using digital textile printing. Digital textile printing means you are able to print for yourself (or for your client) a dress or table-cloth featuring your own design. But it is important to find the right ink technology. With wide format digital technology, you can print onto almost every substrate – that’s why we call it “Wild Format”. However, textile printing for fashion or interior decoration requires a bit more consideration. Planning is necessary to ensure your project becomes the great success it deserves to be. Today, there are two common inkjet technologies: HP Latex and UV-curing inks. Both technologies are used in printers from leading manufacturers like Agfa, EFI, Fujifilm, Mimaki and Roland. While both inks are popular in soft signage textile printing, they were originally developed for advertising applications such as signage, flags and banners. Sometimes at trade shows you will see textile interior decoration printed with UV-curing inks. However, it is important to keep mind that these pieces are for show purposes only because they are neither tested nor intended for contact with human or animal skin. HP have durable textile substrates that are suitable for interior decoration. HP claim that after a heating process washability can be attained. In fact, washability is of one of the key points when it comes to digitally printing textile for fashion and home décor applications. Customers are not likely to accept a T-shirt with a print that fades after just two washing cycles in a common household washing machine. The washability problem is not restricted to just digital textile printing. Therefore, in the long history of textile printing numerous staining options have been developed and some have been adapted for digital print too. The most common digital textile printing technology is a transfer technology. With transfer dye-sub printing the design is printed back-to-front onto very thin paper. Disperse dye process is a far less common approach where the print goes directly onto the textile. In a disperse dye printing process the results are usually not very crisp. This is due to the fact that there is some colour bleeding which leads to print-through, which is appreciated with flags or double-sided textiles. In sublimation printing technology, dry heat from a press or calender sublimates the ink deep into the fibres. This results in a durable dye with moderate light-fastness. Since only the pigments of the ink stay in the cloth, sublimation prints are deemed to be kind to the skin. However, sublimation will only work with a polyester (blend) or polyester coated substrate. This is the reason why sports apparel like cycling shirts are primarily decorated in a digital transfer sublimation process. Roland DG printers are widely used in this area. During the pioneering days of digital textile printing, primed cotton T-shirts were decorated using a sublimation process. Since pigment inks with binders are available in white and process colours have become more available, both light and dark garments are usually printed with pigment inks. They are easy to handle, although normally a pre-treatment coating and heat press finishing is needed for high-quality results. Pigment inks work well with a wide range of natural and man-made fibres, so the technology became more prevalent for digital roll-to-roll textile printing. Pigment inks don’t require a mandatory washing process and are therefore viewed as a eco-friendlier option versus traditional textile printing technologies that need copious amounts of water. However, still it is highly recommended to wash the pigment printed new shirt before wearing it. Water-based direct print digital textile inks come in two main flavours: Acid and Reactive inks. 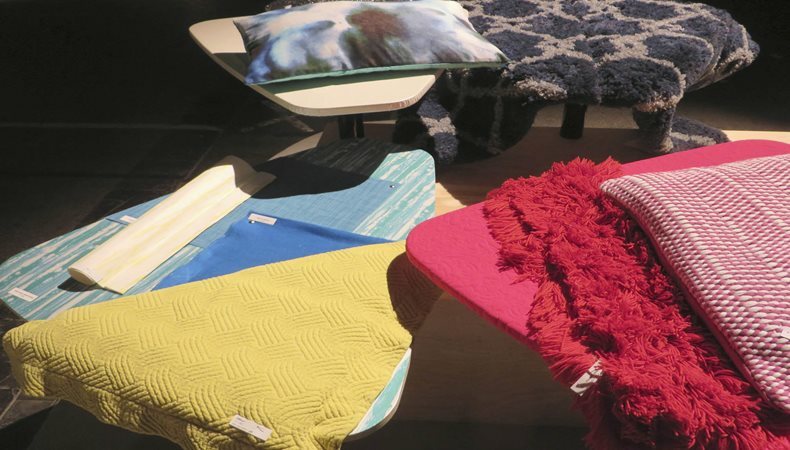 Vat dyes that are used for cellulosic fibres have a very high outdoor light fastness and are beginning to make their first steps into the digital textile printing markets. As a known rule, acid and reactive textile inks are traditional analogue textile printing that is available for digital printing. Of course, most advantages of digital printing remain since no form is required. However, some disadvantages of analogue textile printing are still valid too. The “one ink fits all” concept is not applicable here since acid inks are required to print on wool, silk or Nylon. Cotton and other natural fibres stain best with reactive inks. Steaming and washing is an obligatory finishing for acid and reactive ink prints. This process is the same as the handling of their analogue counterparts. This is why “real” or “textile textile” digital printing that has traditional chemistry is often used together with analogue printing presses in textile printing factories. They will eventually finally replace their analogue predecessors. Finishing and sometimes pre-treatment requires expert knowledge and a wide assortment of expensive machinery is usually not found with your neighbourhood digital print service provider or sign maker. Digital roll-to-roll textile printing with traditional water-based chemistry is considered skin-friendly. There are even processes that are suitable for Oeko-Tex certification. Light-fastness can be decent, the fabrics are suitable for dry cleaning and machine wash. Pigments are transferred deep into the fibres and colours are rub-resistant. Acid and reactive inks are very common with very high and extremely costly digital volume production machines, for example the EFI Reggiani family. However, Mimaki also offers a range of versatile textile printers that features different chemistry and more moderate investment levels. Do I Need Someone from Inditex For My Textile Printing Project?